Helical Screw Blowers Market size will surpass USD 1.15 billion by 2024; according to a new research report by Global Market Insights, Inc. The food & pharmaceuticals industries will have significant demand for helical screw blowers for 100% oil free low-pressure air requirements over the forecast timespan. Principal application of the blowers in this area has been the pneumatic conveying to handle the transfer of dry bulk materials including: salt, flour, sugar, spices, grain, milk powder, and various other manmade and natural food processing dry materials. These blowers exhibit energy consumption up to 30% higher than the lobe blowers for transferring the materials are transferred to and from railcars, silos, hoppers and other bulk transfer components. Screw blowers feature low leakage & parasitic losses as they are characterized by a pair of intermeshing rotors that gradually reduces the volume of air as it moves along the length of the screw elements. The highly efficient operational process as contrast to the rotary lobe or roots blowers will be another important factor propelling the rotary screw blowers market size in the coming years. However, the capital-intensive nature of the rotary screw blower industry might pose as a factor hampering its growth in the immediate future. Screw blower components manufacturer requires higher degree specialization because of their complex designs. The procedures such as designing, test, quality check and manufacturing are highly time consuming which reflects in final product price. Direct drive screw blowers held a share slightly higher than their belt drive counterparts in 2017. Direct drive screw blowers feature less maintenance, smaller footprint and noise free operations. These features are likely to boost their acceptance across the end-user industries, despite their higher costs by 2024. Power segment will have a steady demand for helical screw blowers with an estimated CAGR of around 5.4% by 2024. The ever-growing demand for power generation will be the key factor driving the global helical screw blowers industry in the coming years. Desulphurization in the exhaust flue gases for ensuring the uninterrupted pollution control will be the most demanding application of screw blowers in the power sector by 2024. 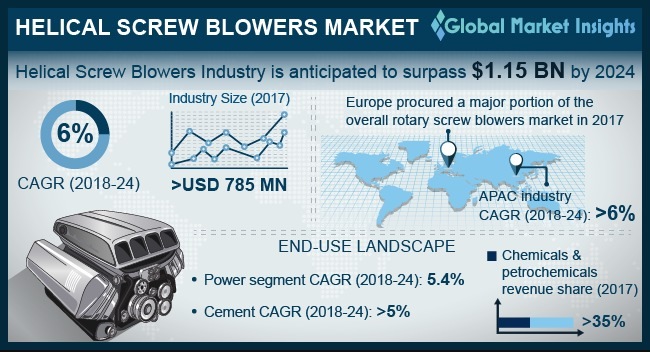 In terms of revenue, Europe led the overall rotary screw blowers industry in 2017. However, Asia Pacific will observe the fastest growth in screw blowers industry with CAGR above 6% in the next seven years. The region is marked by various government initiatives, for instance, the Indian government has been focusing on boosting the national food processing sector by setting up mega food parks in the next five years. Such projects will have common processing facilities such as: pulping, storage, packaging, logistics, etc., wherein screw blowers will have strong growth aspects for low-pressure air requirement. The rotary screw blowers market is characterized by the presence of established large-scale blower manufacturers having a vast geographic reach and product portfolio. The leading industry participants have been: Atlas Copco, Gardner Denver, Inc. and KAESER KOMPRESSOREN, which constituted around 70% share in the overall screw blowers industry 2017. Manufacturers have been investing extensively in research and development to increase their market share.